Scott White, Seaside, Ore., .116, 6.87 elapsed time, 203.89 miles per hour def. 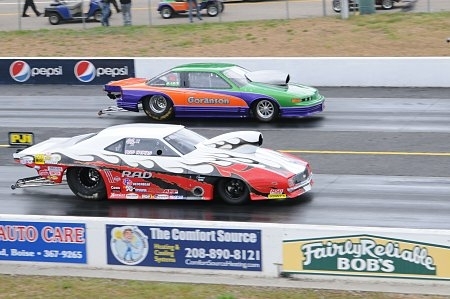 Mitch Chamblerlin, Orting, Wash., .103, 6.90, 204.70. Ed Cutler, Meridian, .001, 9.23 (9.21 dial) 146.10 def. Larry Saunders, Fruitland, -.007 redlight, 8.26 (8.26 dial) 161.23. Eighth-Mark Barnhart; Sean Shaffer; Chris Jaggers; Jim Climer. Jim Coryat, Boise, .029, 9.19 (9.19 dial) 146.61 def. Lisa Thomas, Meridian, .035, 9.83 (9.84 dial) 134.36. Quarter-Tom Davis; Doug Wikfors; Cleve Randall. Eighth-David Deming; Terry Phillips; Debbie Phillips; Brent Borchers; Richie Myers; Marcia Randall. Joseph Karnes, Boise, .037, 12.89 (12.88 dial) 106.40 def. Tyler Rush, Star, .051, 13.27 (13.26 dial) 97.57. Quarter-Kristi Shawver; Blaine Sterling; Luke Jacobson. Eighth-David Austin; Rene Coddens; Lucas Hull; Mary Liese; Glen Phillips; Mike Ritz; Martin Porreca. T.J. Smith, Emmett, .105, 9.41 (9.41 dial) 140.63 def. Greg Sabatino, Meridian, 12.25 (12.24 dial) 105.01. Robert Tuning, Boise, .107, 13.29 (13.18 dial) 91.64 def. Justin Shumway, Meridian, .121, 15.21 (15.04 dial) 93.98. Anthony Keller, Kuna, .074, 10.78 (10.57 dial) 101.26 def. Tim Brown, Boise, .296, 8.81 (8.75 dial) 155.27. Terry Laeger, Pocatello, .055, 10.82 (10.79 dial) 120.38 def. Zak Pedraza, Boise, .069, 11.74 (11.77 dial) 113.34. John Perrone, Star, .049, 14.23 (14.05 dial) 81.40 def. Pamela Lottman, Boise, -.215 redlight, 12.38 (12.32 dial) 108.57. Dan Wilder, Caldwell, 11.36 (11.31 dial) 118.34 def. 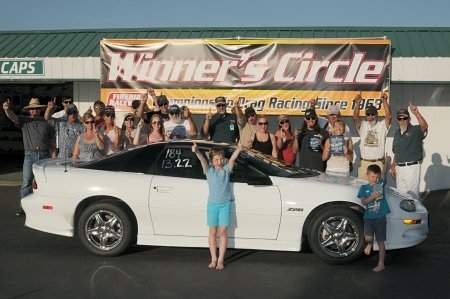 Stan Deming, Nampa, .076, 10.50 (10.52 dial) 116.89. Sunday Show `n Shine award winners: Bill Towler, Jim Percy, Bob Cunningham, Dallas Head, Tom Moore, Mark Austin, Jim & Kay Neely, Michelle & Larry Cossins, Vicki Cannon, Ed May, Kevin Packard, Don Owen/Reid Dahlin, Matt Hiscox, Dan Todd. Levi Burlile, Nampa, .038, 10.30 (10.30 dial) 127.14 def. Glenn Watts, Boise, -.008 redlight, 10.48 (10.48 dial) 128.16. Cody Hiatt, Boise, .190, 17.29 (7.41 dial) 63.43 def. Darrell Carr, -.017 redlight, 11.03 (11.05 dial) 122.58. Steve Pyburn, Nampa, .020, 9.47 (9.49 dial) 141.53 def. Phyllis May, Payette, .014, 11.63 (11.65 dial) 114.72. 1. Mitch Chamberlin, Orting, Wash., 6.94, 202.03. 2. Joel Matton, Oregon City, Ore., 6.96, 208.36. 3. Mike Molea, Grants Pass, Ore., 6.99, 203.37. 4. Scott White, Seaside, Ore., 7.02, 198.64. 5. Monte Grubb, Tacoma, Wash., 7.44, 183.47. 6. Chad Walberg, Junction City, Ore., 8.24, 114.66. 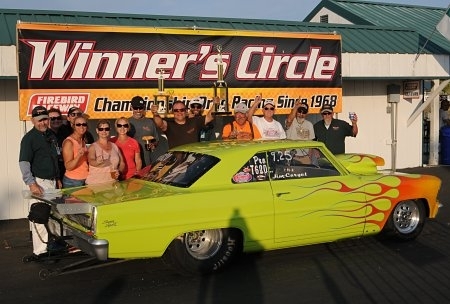 Saturday Show `n Shine award winners: Mike Mattern, Will Simplot/Chris Jaggers, Kelly Robat, Joe Piccione, Jason Arrien, Mike Madarieta, Gordon Boven, Spregg Roundy, Don Chivington, Brad Stalling, Greg Howsen, Ron Liese, Stuart Robertson, Tim Wallace, Jeff Hugie, Mike Ennis. 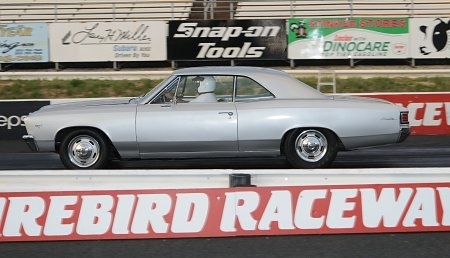 The opening round of the Peterson Chevrolet Midnight Drags attracted a good field of cars and trucks who took to the quarter-mile track for unlimited grudge racing. Although the weather forecast was projecting heavy thundershowers and precipitation, not a drop fell on the raceway (although surrounding areas reportedly received several strong storms and heavy rain). Steady headwinds to start the evening simmered by nightfall as racers took advantage of the first official night race of the season. Those seeking multiple grudge heats were rewarded with upwards of 7-8 passes at the late-night affair. The night also yielded quite a number of new qualifiers in the 100 mph club as cooler conditions (temps averaged in the 70’s during the daylight hours, but dropped into the 60’s when darkness set in). 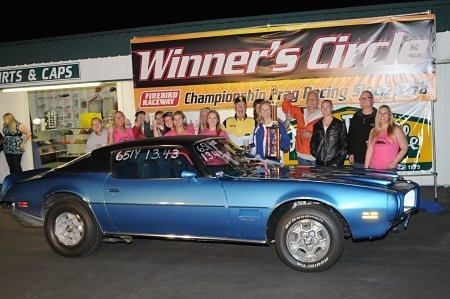 Round 2 of the Midnight grudge races will take place, Saturday night, June 13th – pass the word! 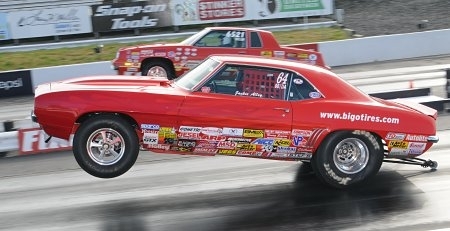 Joe Witherspoon, Melba Outlaws, .055 reaction time, 11.00 elapsed time (10.98 dial) 120.32 miles per hour def. 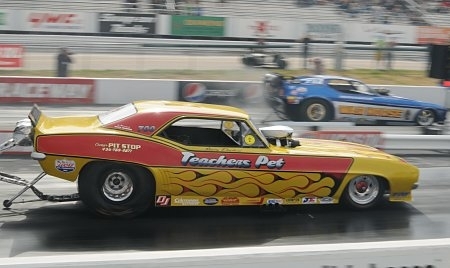 Ken Casteel, Mopar Mafia, -.187, 13.48 (10.33 dial) 71.89. Quarter-Steve Pyburn, Melba Outlaws; Bill Muchow, Melba Outlaws; Chad Campbell, PSI Racing. Lucas Hull, Melba Outlaws, .029, 12.18 (12.13 dial) 108.61 def. Rose Shaw, Naughty Girls, 11.81 (11.79 dial) 112.18. Semi-Mike Ritz, Valley Vettes; Clyde Hughes, Mopar Mafia. Quarter-Lisa Johnson, Naughty Girls; Tom Ash, Melba Outlaws; Matt Roderick, Flying Brick. Eighth-Chad Rhode, Outsiders; Tim Shawver, Down `n Dirty; Josh Cirelli, Flying Brick; Janet Nefzger, The Barons; John Wong, Flying Brick; Nick Marsala, The Barons. Mary Liese, Naughty Girls, .053, 13.50 (13.43 dial) 101.90 def. David Meimann, Modern Rodders, .062, 14.25 (14.28 dial) 97.00. Quarter-Grant Middleton, PSI Racing; Tyler Rush, Kuna Knuckle Draggers; Darron Hoskins, Down `n Dirty. Eighth-Robert Johnson, AMC Racing; Jacob Rogers, Middleton Muscle; Kristi Shawver, Down `n Dirty; Richard Lally, The Barons; Chris Bidondo, Down `n Dirty; Mike Smith, Kuna Knuckle Draggers. Celin Adams, 3800 Club, .233, 14.59 (14.50 dial) 95.89 def. Judd Trolard, Melba Outlaws, .126, 14.87 (14.60 dial) 82.34. Quarter-Fuzzy Sterling, Down `n Dirty; Eric Anderson, Venom Racing. Eighth-Janet Barrett, PSI Racing; Scott Benton, Tates Rents; Russ Hoff, Mopar Mafia; Tyson York, CY Trucking. Danielle Booher, Modern Rodders, .248, 15.82 (15.70 dial) 86.01 def. Tony Phillips, Racerz Edge, .265, 16.66 (16.45 dial) 80.23. Quarter-Troy Jensen, Venom Racing; David Whitaker, The A-Team; Kevin Griffin, 3800 Club. Eighth-Chance Hilt, Racerz Edge; Kaden Lager, Racerz Edge; Kassidy Rasmussen, Melba Outlaws; Bryn Anderson, Venom Racing; Trei Walker, Racerz Edge; Brian Ross, Melba Outlaws. Steven Densham, Bellflower, Calif., 5.81 elapsed time, 240.25 miles per hour def. Roger Garten, Fallbrook, Calif., redlight. Jeff Lane, North Bend, Wash., 8.15, 148.95 def. Dale Giroux, Canyon Creek, Alta., 7.08, 195.28. Mark Faul, Tacoma, Wash., 18.30, 61.48 def. Jody Lang, Puyallup, Wash., broke. Scott Burton, Golden, Colo., 10.63, 109.55 def. Brad Burton, Snohomish, Wash., 10.89, 118.96. Mike Shannon, Kelowna, BC, 9.16, 169.10 def. Katie Harkema, Hayden, ID, 9.13, 160.54. Mike Coltrin, Boise, ID, 10.13, 156.03 def. John Whitmore, Myrtle Creek, Ore., 10.10, 170.62. Dan Provost, Abbotsford, BC, 6.71, 199.05 def. John Chitwood, Saint Helens, Ore., 7.05, 190.08. Jake Neibauer, Billings, Mont., 7.10, 187.86 def. Ed Olpin, Pleasant Grove, Utah, 7.42, 187.57. Rick Newport, Bluffdale, Utah, 8.17, 154.37 def. Dave Toth, Medicine Hat, Alta., 9.04, 144.01. Mark Barnhart, Emmett, ID, 7.65, 171.55 def. Ed Hauter, Lynnwood, Wash., 7.44, 172.34. Joe Witherspoon, Caldwell, ID, 10.88, 122.72 def. Chad Campbell, Meridian, ID, 10.01, 125.25. Troy McDonald, Nampa, ID, 14.52, 94.58 def. Russell Rowley, Provo, Utah, 11.98, 108.09. Layne Fiscus .112, 9.09 (9.04 dial) 69.72 def. Michael Jaggers .097, 8.72 (8.63 dial) 71.27. Quarter-Paige Harris, Levi Burke, Alexis Pisca. Mark Barnhart, .007 reaction time, 7.68 elapsed time (7.69 dial) 171.72 miles per hour def. Brad Pattan, .011, 8.65 (8.67 dial) 161.00. Quarter-Victor Clark, Cody Hiatt, Troy Pecht. Eighth-Mike Scarpelli, Andrew Clark, Seth McLean, Steve Reynolds, Sam Northup, Christopher Northup. Jerry Hodges, .006, 10.76 (10.24 dial) 99.18 def. Jason Thomas, -.023 redlight. Quarter-Joe Witherspoon, Ed O’Hara, Levi Burlile. Eighth-Greg Sabatino, Les Migneault, Stan Deming, Seth McLean, Lisa Thomas, Bret Ward, Katie Baun. Catherine Seamons (pictured), .064, 13.27 (13.22 dial) 102.88 def. Tyler Rush, .087, 13.17 (13.13 dial) 97.30. Quarter-David Meimann, Chuck Shroll, Tom Farmer. Eighth-Lucas Hull, Necia Cox, Stephanie Meimann, Gary Kruger, Jonathan Palmer, Don Bruce. Chase Bittick, .074, 10.80 (10.89 dial) 116.55 def. Craig Jensen, .065, 9.61 (9.70 dial) 120.48. Quarter-David Wood, Gerard Stanberry, Ashton Davis. Justin Hof, .160, 7.95 (7.92 dial) 76.99 def. August Basile, .265, 9.10 (9.12 dial) 69.69. Quarter-Summer Seckett Clark, Rion Coates, Ty Sasser, Hannah VanderMeer. Jeffrey Langan, .016, 11.54 (11.55 dial) 113.67 def. Patrick Bailey, .014, 10.51 (10.52 dial) 125.97. Quarter-Linda Rowland, Doug Wikfors, Marcia Randall. Greg Sabatino, .039, 12.35 (12.26 dial) 106.71 def. Ryan Resinkin, -.015 redlight, 10.99 (10.95 dial) 120.88. Richard Zollinger, .010, 17.18 (17.29 dial) def. Nick Phillips, -.002 foul, 15.99 (15.94 dial) 86.60. Frank Wilson, .101, 12.85 (12.60 dial) 89.79 def. Monte Stark, .362, 13.74 (13.65 dial) 97.87. Fuzzy Sterling, .086, 13.05 (13.00 dial) 105.25 def. Clyde Hughes, .093, 12.46 (12.40 dial) 108.27. Show `n Shine – Truck – Stuart Robertson, Michael Johnson, Scott Duncan, Herm Pullman, Doug Cole. 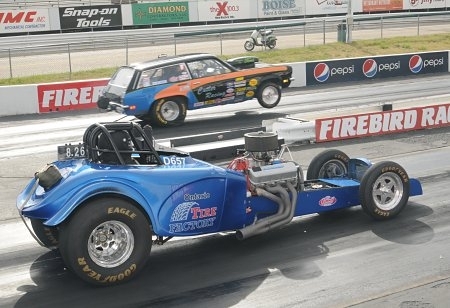 Jim Coryat (pictured), Boise, .044 reaction time, 9.21 elapsed time (9.25 dial) 137.86 miles per hour def. Lucas Hull, Middleton, .011, 12.15 (12.24 dial) 102.93. Semi-Duston Wurtz, Nampa; Jeff Fetty, Middleton. Ed Cutler, Meridian, .039, 9.20 (9.20 dial) 145.39 def. Chris Jagger, Middleton, .020, 7.99 (7.95 dial) 167.06. Semi-Sam Northup, Boise; John Shaffer, Boise. Quarter-Larry Saunders, Fruitland; Juliet Barnhart, Emmett; Steve Lambert, Boise. Carl Youngstrom, Caldwell, .034, 9.66 (9.68 dial) 136.19 def. Doug Wikforss, Eagle, .107, 11.47 (11.52 dial) 116.82. Quarter-Richard Rush, Boise; Jerry Hodges, Boise; Andy Strunk, Emmett. Eighth-Jeffrey Langan, Boise; Tom Davis, Meridian; Patrick Bailey, Pocatello; Glenn Watts, Boise; Richie Myers, Fruitland; Dan Tuttle, Weiser. Joseph Karnes, Miami, FL, .031, 12.79 (12.83 dial) 106.54 def. Blaine Sterling, Caldwell, .049, 11.97 (12.04 dial) 107.75. Semi-Chuck Shroll, Kuna; Luke Jacobson, Caldwell. Quarter-Lucas Hull, Middleton; Tyler Rush, Star; Juan Banda, Ontario, Ore.
Eighth-Kyle Witherspoon, Boise; Shannon Dougal, Eagle; Necia Cox, Boise; Tom Farmer, Nampa; Lee Zimmerman, Nampa; Catherine Seamons, Kuna. Scott Grondahl, Nampa, .053, 10.00 (9.95 dial) 134.18 def. Dave Allen, .167, 8.52 (8.59 dial) 155.87. Quarter-Craig Jensen, Chubbuck; Dave Wood, Eagle. Justin Hof, Nampa, 7.97 (7.90 dial) 75.21 def. Layne Fiscus, Boise, .092, 9.10 (9.11 dial) 70.23. Quarter-Rion Coates, Eagle; Michael Jaggers, Middleton; Levi Burke, Bates, Ore.
Jim Coryat, Boise, .018, 9.21 (9.22 dial) 136.44 def. Zak Pedraza, Boise, .012, 11.67 (11.68 dial) 116.12. Semi-Carl Youngstrom, Caldwell; Dan Wilder, Caldwell. Quarter-Randy Mayer, American Falls; Pamela Lottman, Boise; Ryan Resinkin, Emmett; Carl Downard, Boise. Wes Pyburn, Meridian, .012, 10.65 (10.59 dial) 121.98 def. Matt Rojas, Idaho Falls, .112, 10.36 (10.35 dial) 129.73. Semi-Kyle Witherspoon, Boise; Bill Muchow, Melba. Jeff Fetty, Middleton, .046, 14.59 (14.57 dial) 92.78 def. Earl McCollough, Caldwell, -.029 redlight, 13.22 (13.23 dial) 102.15. Steve Pflieger, Nampa, .072, 12.42 (12.51 dial0 108.13 uncostested. Jerry Trolard, Vale, Ore., .145, 12.11 (12.12 dial) 109.80 def. Luana Skibiel, Boise, -.500, 29.72 (12.93 dial) 104.38. Lucas Hull, Middleton, .050, 12.26 (12.28 dial) 104.23 def. Shannon Dougal, Eagle, .068, 13.43 (13.47 dial) 102.72. Michael Larson, Nampa, .070, 12.21 (12.20 dial) 114.38 def. Fuzzy Sterling, Boise, -.265, 12.99 (13.02 dial) 105.41. Semi-Catherine Seamons, Kuna; Bobby Seaton, Nampa. Duston Wurtz, Nampa, .044, 14.68 (14.68 dial) 86.29 def. Brent Downing, Weiser, .145, 14.59 (14.81 dial) 88.40. Denise Clark, Boise, .072, 10.40 (10.38 dial) 123.83 def. Debbie Pisca, Caldwell, .097, 12.48 (12.50 dial) 109.70. Show `n Shine – Chevy – Carl Downard, Boise; Todd Porter, Rigby; Jason Thomas, Meridian; Bobby Seaton, Nampa; Troy Lind, Meridian. Show ` Shine – Ford – Bill Muchow, Melba; Mike Drummond, Ontario, Ore.; Eldon Twitty, Boise; Lee Dougal, Eagle; Matt Rojas, Idaho Falls. All of us can almost feel the energy and excitement building for our official kickoff of the 2015 NHRA Drag Racing Season at Firebird. Now is the time to make your plans to be a part of the 45th Annual NAPA Auto Parts Ignitor Nitro Opener on Thursday-Sunday, May 14th-17th. We’re all but ready to kick things into gear for our first major racing weekend of the season. Headlining the Ignitor will be the return of AA/Nitro Funny Cars in the Stinker Stores Nitro Knockout. The Opener is a key point’s event in the NHRA Hot Rod Heritage Series. 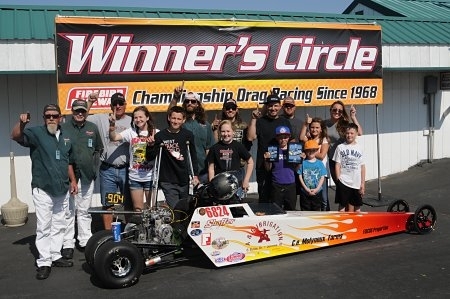 In addition, it marks the first stop for sportsman competitors in the Division 6 Lucas Oil Drag Race Series and a premium point’s event in the Boise Muffler Gold Cup Series. For your convenience, specific hours and admission prices are detailed below. All adult and kids tickets are sold at the entrance upon arrival. Pre-entry deadline for racers: May 7, 2015 (postmark). Open to all racers who would like to post-enter at the front gates after this date during the hours noted (above). For more ticket information, Firebird hotline: 208.938.8986. Firebird is located 5 miles north of Hwy 44 on Hwy 16 (just follow the highway directional signs), northwest of Eagle.